It has been fifteen (15) years since September 11, 2001. It is a day seared in our hearts and minds. Today, we are far from where we thought we would be 15 years after the jihadi attacks of 9/11. America lost two wars in Iraq and Afghanistan, and we lost thousands of American lives since 9/11. Many have allowed themselves to be lied to about the true nature of the threat without any evidence they care about their ignorance. Our leaders in both political parties have betrayed us and brought the Republic to a gravely dangerous point in our history. Some say we are on the brink of destruction. This weekend is meant to remember the dead of September 11, 2001, but it is also a time for Americans to dedicate themselves to defending freedom without apology. It is a time to recall our duties as citizen soldiers, stand in the gap and refuse to surrender one more inch to tyranny and evil. Freedom to speak your mind without concern for whom might be offended. Freedom to declare the truth about America’s founding as a nation created by God’s divine providence. Freedom to declare our rights come from God, and no man nor any government nor any tyrannical movement can take them from us. But Freedom must be fought for. We are at war whether you like it or not, and this fight requires mature adults who understand what is at stake to step up and engage wherever needed. And our time is short. The culmination of decades of work by the hard left/Marxist and Islamic jihadi Movements in the U.S. is coming to fruition right now. The enemy is on the move. The Marxists and Jihadis are concentrating their forces. Marxism, Communism and Socialism are evil systems. They necessarily enslave people and, as history has repeatedly demonstrated, they are systems where few hold power over the masses – and the masses suffer greatly under that tyranny. Islam obliges jihad (warfare against non-Muslims) until sharia is the law of the land. This totalitarian system also enslaves and murders those who do not subscribe to its doctrines. The four key pillars of our society – Religion, Politics, Education, Media (free press?) – have been nearly obliterated by the hard-left/Marxists. The Islamic Movement wages their war against Freedom on the very ground given to them by these Marxists. Action at the local level needs to be taken now. It is time to take our schools back. Our universities may be unrecoverable, but our elementary and junior high schools are not. Teachers teaching lies about America’s history should be aggressively made to teach the truth or bounced out of school. The Bible should be, once again, the primary text for teaching morality and good character, among other things. Christian Pastors who preach that any/all behavior is okay, Islam is peaceful, and that we should never offend others, are denying the faith of our founders and undermining the principles of “the law of nature (Natural Law) and nature’s God (Holy Scripture)” upon which our legal system and government are founded. Such Pastors should be tossed out of their churches by their ears. That is not “mean,” it is loving to all the people being corrupted by their evil teachings. Elected officials who continue to violate their Oaths of Office must be held accountable to the people, who are the sovereign in the United States of America. It begins at the local level. Media outlets and reporters who continue to be mouthpieces for both the Marxist and Islamic Movements must be held to account. Whether station sponsors are petitioned or the individual reporters shamed into speaking truth or quitting, action must be taken. The two most important groups of people in returning the Republic to order and freedom are Sheriffs (most powerful law enforcement officers in America) and Pastors. If a sheriff and the citizens (motivated by their Pastors) in any given U.S. county or parish understand the dangers we face, they can legally, aggressively, and thoughtfully identify and dismantle the Marxist and Islamic network in their area. County by county and state by state we can build fortresses of Freedom. If battle frightens you and you just want peace, you can have it in an instant. You can surrender. But we in a battle for the soul of our Republic and that requires action and it requires a fight. Yes, this Presidential election is critical, and some people may feel a victory for Mr. Trump may not be victory for conservative Patriots. But a defeat for Mr. Trump will be a defeat for all of us. However, this is a counterinsurgency and the focus of main effort is at the local level. 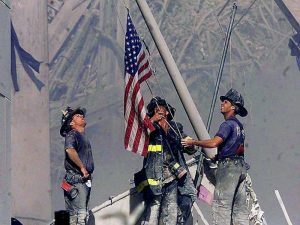 On this 9/11 anniversary, the cry once again is “Freedom.” This is not a slogan nor is it hyperbole. We are in a war and we need to start acting like it. Lets put Freedom back on the offensive – where it belongs. In light of elucidated revelations today which point to the possibility of criminal collusion respecting the FBI Director’s intent to grant to two private-sector individuals transactional immunity involving national security issues which ultimately include the endangerment of American lives, and since any such collusion on the part of a high-ranking federal official which aids an existential enemy of the United States in time of war wouldn’t simply equate to malfeasance, but treason, a special prosecutor should be named forthwith by the Department of Justice to contextually depose said Director et al. Outstanding words! Gives me chills to read it as it is the very essence of where we are as a nation! I’ve read it and re-read it. I pray many read it as I have. Time is short and we have little time to waste. And you have said for so many years that action is required at the local level. Those words have stayed with me as I continue to work my local community to educate, inform, and make a stand!!! God bless you and all you do, my friend!